I didn't notice what they were like before so don't know how much they took off. Maybe someone who hasn't had it filed down can show us a picture of that area on their Panamera so we can see the before and after?? My car is going back in to the dealer to have the fuel filler flap fixed again. This will be the third time. Last time they installed a new flap but the mechanism has gotten worse again over the past six months. The problem was present on a 2017 Panamera 4 that I owned for a year, plus on every ‘new’ Panamera that I borrowed from the Porsche Centre. 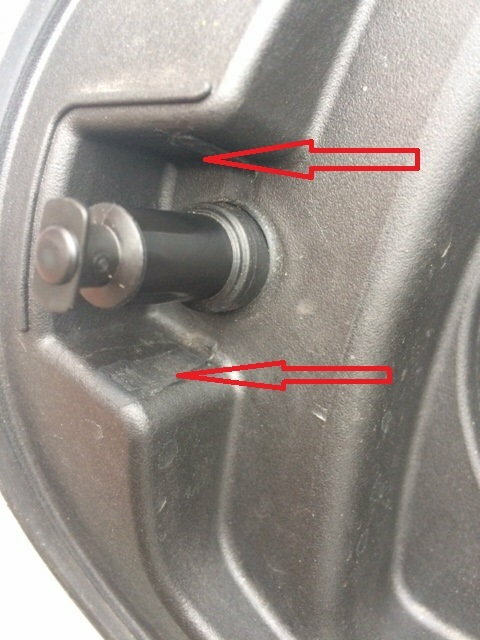 This latching mechanism looks exactly the same as what's used on the Audi A1 that my wife has and had the same problem. It got stuck and didn't even open with the safety release in the bonnet. IMHO the mechanism is flimsy, more so considering it's a Porsche... and there are two on the hybrid. I hope they won't fail soon but I think it's just a matter of time. My qcar is going back in to the dealer to have the fuel filler flap fixed again. This will be the third time. Last time they installed a new flap but the mechanism has gotten worse again over the past six months. This is disturbing to hear. After almost one full year of ownership my wife's 2018 began having problems getting the flap open. We brought it in for its first year service and the dealer is ordering a new flap. My original concern was that they wouldn't match the paint exactly. Now I'm concerned even if they do it might not work long term. I took our 2018 to the dealer on 12/31 to get the power steering recall done (and other stuff) and was told there is a very new recall for sticking gas flaps. I don’t know the details so I can’t comment as to whether it’s the same thing as above. Yeah there is, its also to do with them not being totally flush with the body panel. My biz partner just had his flap changed, waiting to get mine done next time it goes in. I find it hard to open the charging flap on my hybrid, just got it. I’m taking my car back in at the end of this week to have the second gas flap recall performed. The new flap will have to be painted again. Funny thing is that the flap also stuck on the loaner car that they offered me. I'm also getting mine done together with the power steering issue and apparently 5 other outstanding service actions. I hope it involves updating the PCM as well. Maybe that will enable programming the diamond button on steering wheel for suspension lift and being able to reindex the music on the USB drive. My wife took her car in today to get the fuel filler flap replaced. They matched the paint perfectly and the flap is flush. Now let's see if it works over the next few years. I have had the hybrid flap mechanism changed (or at least they are saying it has been changed), looks exactly the same and it has failed again in the cold weather this morning. Drove to work with the flap open, it closed when I arrived at work, presumably it had thawed out. The other annoying issue is the hybrid button feezing, took me 5 mins this morning press the button to try and get the system to disengage. Seriously unimpressed with this element of the car. I also had to have the fuel flap mechanism adjusted as well, would usually only open after three to four attempts.